Step 1: Send an enquiry to Croatian Estate. Our team will be happy to help you find a perfect property for you. All you need to do is contact our office with a list of your wishes, such as: type/size of property, your preferred location(s), your plans to visit Croatia, your budget etc. so we can create a nice portfolio of properties for you to see. When you have chosen your ideal property, we will begin negotiations with the seller. Once both the seller and yourself agree on the price, you may choose your lawyer, or you can use our in-house lawyer, if you prefer (this would be included in our agency fee). Regardless of your choice we will continue acting as your agent throughout the process. Step 3: Deciding on the method of property purchase – Private or Company? All citizens of EU have the right to purchase real estate in Croatia as private buyers. The same right is also granted to citizens of countries outside the EU, under condition of reciprocity. The citizens of countries which have no reciprocity agreement with Croatia may purchase real estate in Croatia subject to approval by the Croatian Ministry of Justice (this usually takes no more than 3 months); or they can choose to set up a Croatian company which would then acquire the property. 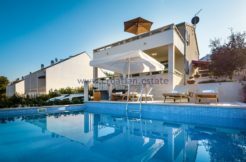 This route is often chosen by the buyers who wish to own a Croatian property as a holiday home but also as an investment (to rent out when they are not in Croatia). The approval of the Ministry of Justice is in this case not needed. Setting up a company is one of the services Immo offers to its clients. This is usually a simple and straight forward process in Croatia and takes up to 2 weeks, with the requirement of a minimum of 20,000 Kuna (approx. 2.700 €) base capital. The company must have a bank account, and an accountant (the cost is around 200 €, depending on the activity of the company). The first and most important information for the lawyer to check is the title, as in the past many properties were sold and purchased lacking proper documents and registration. The lawyer then draws up the purchase contract (or a preliminary contract in case the full price is not paid). This document is signed by the seller and buyer, and witnessed by a Notary Public. On payment of the full purchase price, the seller provides the buyer with a Clausula Intabulandi (Tabular Statement), a document allowing the buyer to register his/her name in the Land Registry books as the new owner of the property. The lawyer then applies for transfer of title to the Land Registry (and/or if necessary to the Ministry of Justice), and submits the documentation to the local tax authority to calculate the amount of the real estate transfer tax. The lawyer will also make arrangements to transfer all utility charges and other costs related to the ownership of the property from the seller’s name to the new owner. Property transfer tax: 4% of the value of property (the amount is assessed and determined by the tax authorities). transfer of all utility invoices from the seller’s name to the buyer’s (water, electricity, communal charges).